Hong Kong, near Star Ferry Terminal, 2013. As global water levels and temperatures rise, plants and animals are mutating to adapt. Strange new creatures are arising at the interstices between plant and animal, questioning and transgressing the boundaries of what is considered to be reactive flora or active fauna. In 2013, one such form was observed to follow the route of the Star Ferries between Hong Kong and Kowloon. 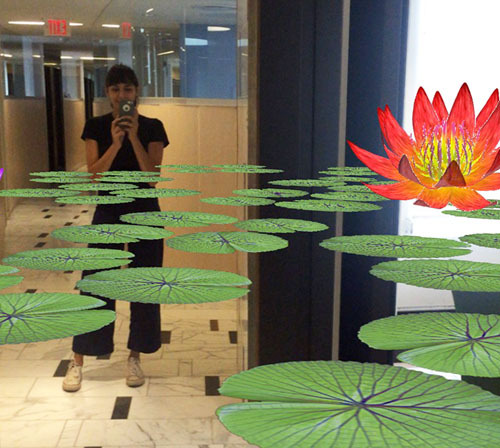 Apparently sensitive to the mediated human gaze, a seemingly small, innocuous water lily can enlarge to engulf viewers who look at it in the display of their mobile app. It is hypothesized that it feeds off energy, not only that dissipated by the ferry boats, but also that of the human cargo and their electronic devices. Until now viewers have reported feeling no effects other than a temporary fibrillation. Scientists worry however that future mutations could cross boundaries between insentient plant and sentient, perhaps even carnivorous life forms. The rare photograph above was made by DAW International, which discovered the invasion during the Virtuale media art exhibit at SIGGRAPH Asia 2013. 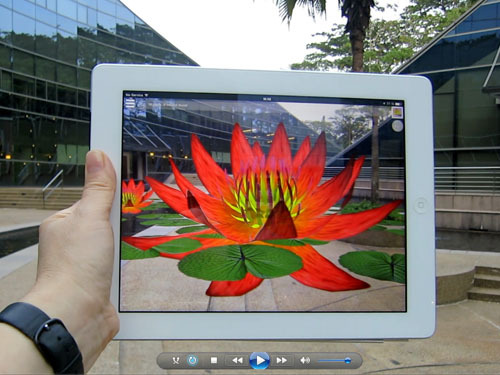 T hen, in January 2014, this amateur video was made in the courtyard of the School of Art, Design and Media of the Nanyang Technological University in Singapore. 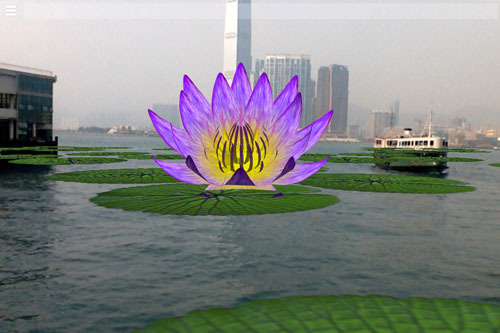 The invasive water lilies seemed to have followed currents in the South China Sea ("Nanyang") to Singapore, and made their way inland through the water mains. 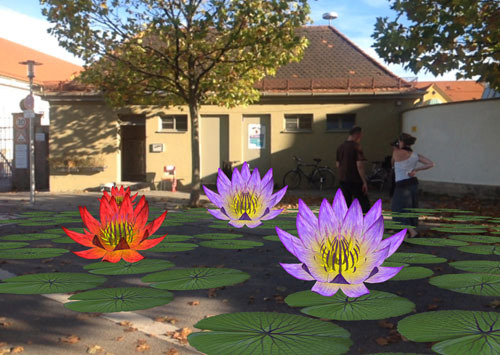 The "follow the money" theory had to be discarded a couple months later, however, as in October 2014 the Water Lily Invasion was discovered on dry land - in and around the KloHäuschen in Munich, an art space in an abandoned public toilet. Scientists theorize that the invasives came along hidden water lines through the earth and have burst out of the pipes that once fed into the toilets.This could be a very dangerous mutation, as they are no longer restricted to water and are clearly following human media art activity - the Water Lilies invaded during the KloHäuschen Biennial. 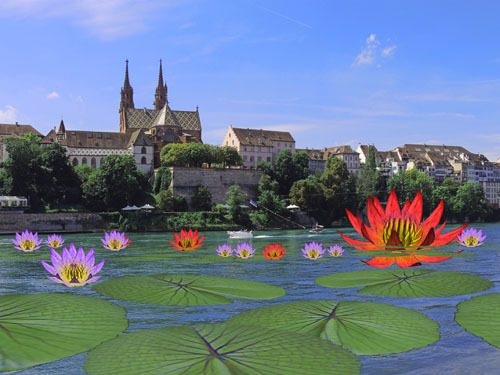 In 2015 no new sightings were reported, but in 2016 the Water Lily Invasion extended to Lake Lugano in Switzerland. As the Virtuale Switzerland was being held in Lugano during this time, it seems clear that the invasive plants are actually being transported as spores nested in the mobile devices of the organizers. The authorities requested a complete factory reset of their devices, and it is hoped that this will control further outbreaks. 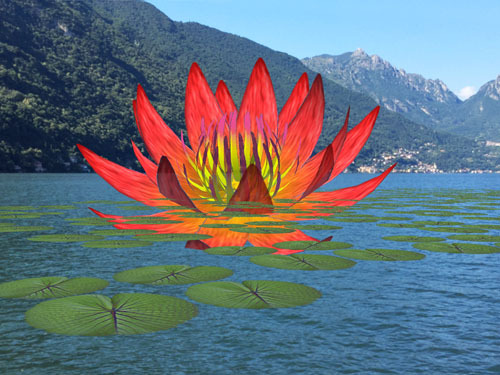 Water Lily Invasion, Lake Lugano. 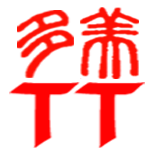 Photo: Virtuale Switzerland. Unfortunately the hope of containing Water Lily Invasion was short lived. A new infestation broke out at the University of Toronto Jackman Humanities Institute during the exhibit "All This Time ..." The city is on Lake Ontario, but the Institute has no connecting waterflows - except through the city sewage system. As with the infestation at the Klohäuschen in Munich, this seems to be the most likely route of invasion. This is the first reported case in the Americas, so the invasion has really become global at this point. Students and faculty at the Institute are complaining of lack of concentration and focus. It is not clear whether this is because they are spending too much time viewing the water lilies, or whether the water lilies are beginning to feed off their brainwaves in addition to the radiation from their mobile devices.